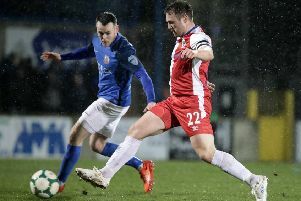 Glenavon manager Gary Hamilton is far from happy that his side are facing Dungannon Swifts in the Irish Cup on Monday night. The Lurgan Blues boss vented his frustration after his side’s 2-1 win against Ards at the weekend. 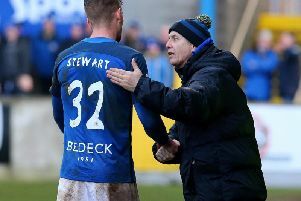 Hamilton’s men will now face the Swifts in the Irish Cup Sixth Round tonight and the Glenavon manager is not impressed. “It is ridiculous and no matter what you say about it , I don’t know who makes the decision - the IFA or NIFL but tell me a team in England, Scotland, Spain that are asked to play two games in three days? “Tell me any team that has to do this? It does not happen. And how they ask part-time players who are working to do this is disgraceful. “The powers to be have to take a good, long hard look at themselves. This is the top Cup competition in this country and they asking players to play after playing 90 minutes on the Saturday. “If I was a sponsor I would be pulling out of it because you are looking quality games and for people to come out and watch and it won’t happen. “There were teams on Saturday involved in relegation battles and looking for places in Europe - so it is vital that they are getting points but they are asking these players to go out on a Monday night and put on a performance of high quality and entertainment for players on Monday. “It’s not possible and it’s wrong and whoever decided this needs their head looked at. It only happens in this country and I mean only in this country. “Look the matches were called off last Saturday and there was only one game during the week - Coleraine versus Dungannon. “The league split is not for six weeks and the next Irish Cup is three to four weeks, so there is more time to get that game squeezed in.